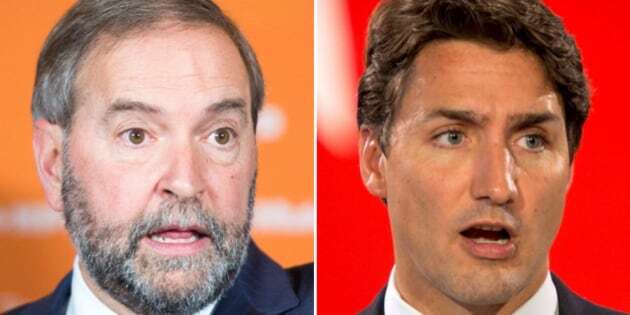 "Justin Trudeau's Liberals stood with Stephen Harper on C-51, and now they will join with him again to help cut jobs in our tourism, agriculture and auto sectors,'' Mulcair said. TORONTO — The New Democrats were refocusing their campaign attacks Thursday squarely on the Liberals as Justin Trudeau raises more questions about Tom Mulcair's fiscal calculations. In Toronto for a town hall-style meeting with supporters, Mulcair accused the Liberals of walking in step with Stephen Harper's Conservatives, first by voting in favour of Bill C-51, and now by refusing to denounce the Trans-Pacific Partnership announced this week. "Justin Trudeau's Liberals stood with Stephen Harper on C-51, and now they will join with him again to help cut jobs in our tourism, agriculture and auto sectors,'' Mulcair said in a prepared text of his speech. The Liberals launched an attack of their own, with their party operatives handing out leaflets at the NDP town hall, which quote an Ontario New Democrat candidate questioning her own party's fiscal promises. The NDP has pledged to balance the federal budget, even with new spending proposals on a range of measures from aboriginal education to its $15 dollar-a-day daycare plan. Mulcair has insisted all this week that his fiscal plan is sound, saying the budget can be balanced by eliminating Conservative initiatives, such as tax breaks for large corporations.